Happy Ides of March! Have I got some prophetic news for you today! Want to make a million bucks? Want to break down the publishing hierarchy’s gates? Want to get that book out worldwide to millions of people in the whisper of a few short button-pushing moments? All of this can be yours and more! Does any of this sound a LOT like the blogosphere bubble that came and went last decade? Did anyone “get rich” (with or without a lot of hard work?). Yes. A few. A very few did. 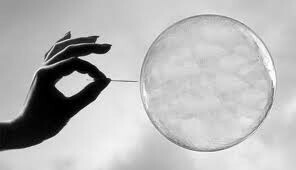 The larger point is that it was a bubble. People got excited. Big promises were made. Loads of investments committed. The bubble burst. People fell from grace, weeping and gnashing their teeth. Do we still love blogs? Well, yeah! You’re reading one, right? Do we see them for what they are in this Age of Information? Not to burst your bubble, but hopefully by now, yes, we have checked back in with reality. Except now there are books to be written! Money to be made! And, you know what, I dare say that if you’re really ready to act fast and maximize your opportunities (to use entrepreneurial language), you may be able to get in on the act. Ewan Morrison, a writer who has found he makes far more money and generates a far wider audience by writing about the end of books as opposed to publishing them, points out that a lot of what the internet gurus have been predicting for some time is actually coming true. It’s true that books–cultural artifacts–are becoming increasingly harder to move across the entire industry (not just for you literary types). Ironically or not, you still do need to have “that book,” it’s just that the book is more a credentializing agent, which gets you the things that do increasingly pay: speeches and gigs. For an extremely detailed analysis as to why exactly we can call this whole thing a bubble, see Morrison’s article. These are heady times in social media and ebook publication. Ebook sales are already outpacing print sales. Publisher’s Weekly offers loads of other stats to verify the point. Self publishing gurus emerge daily with programs and advice on how to self publish your book. While there are limitations to social media’s power and reach (there’s a reason why it’s called “social” media as opposed to “mainstream,” right? ), it’s a juggernaut. First, however, there’s a difference between social media and ebook publishing, and there’s even another difference between publishing an ebook and self-publishing an ebook. This may seem obvious, but the lines do begin to blur between the distinctions. There is hype, and I’m not saying don’t believe it. The bubble is happening. My prediction is that we’re probably at the relative beginning of a bubble, but it is a bubble.